Nagare (nah-ga-ray) is a Japanese word meaning Flow. The two boats in this group are 17 and 21 feet in length and are known simply as the Nagare 17 and the Nagare 21. 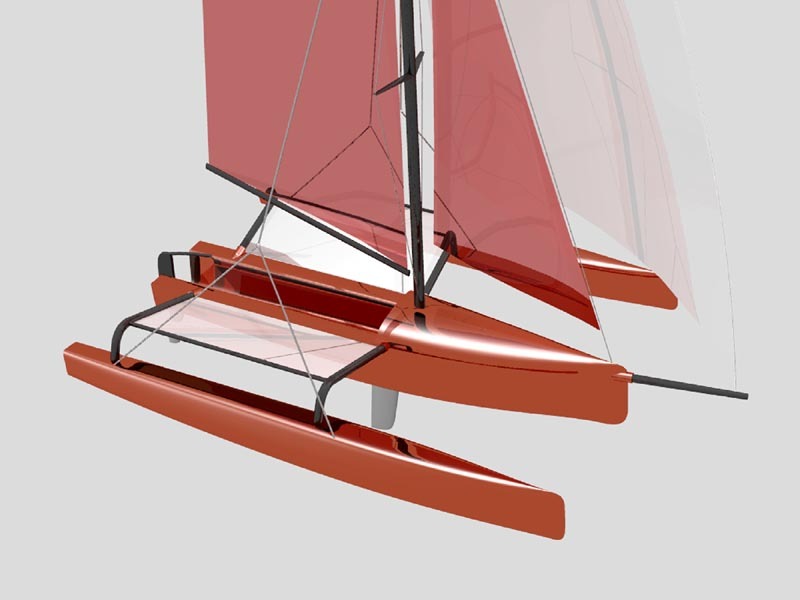 Both designs make use of the popular Hobie Mirage drive for principal propulsion with the 21 footer being a double Mirage setup and the 17relying on a single Mirage. 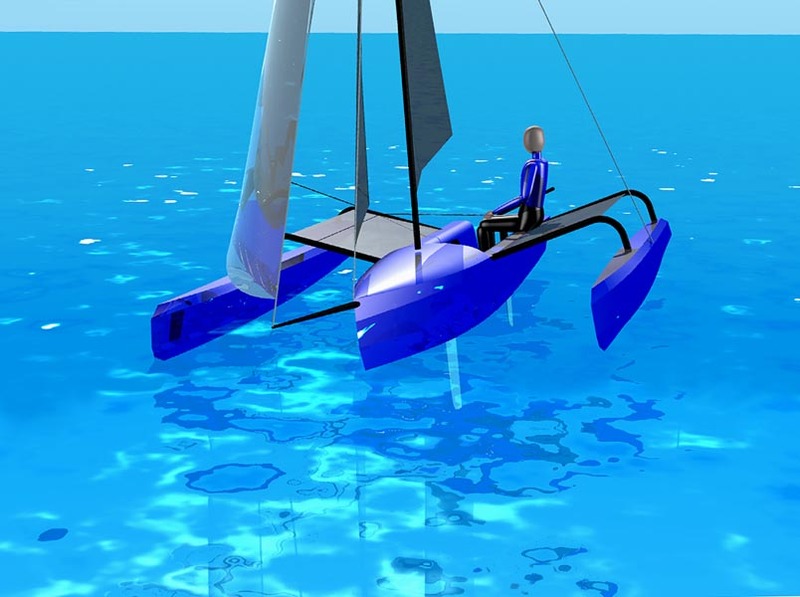 Both of them are configured as trimarans with fairly small and unobtrusive amas designed to give the boats remarkable stability in a wide range of conditions while allowing the vaka, (main) hull to be decidely slender for more effective drive through the water. The Nagare sisters also have incredibly narrow waterline beam numbers that, when coupled with their fairly long hulls provide for very easily driven hull forms for high efficiency per unit of energy applied. I expect both boats to operate at the very high end of commercially available paddled boats of the same length, beam and weight. So, yes, they can go pretty quickly, but that’s not the real purpose. The real benefit of the design genre is through the ease with which they are propelled at any given speed, compared to other boats of their size. This efficiency translates directly to those using the boats as less tiring for miles covered, or greater speed with the same effort as other, wider designs. Because the propulsion is derived from the largest muscles in your body, the leg muscles, rather than the arms and shoulders, there will be less fatigue for each mile traveled. Because leg muscles are so much bigger than arms, they will be able to do more work in a given period of time, making for longer possible trips, as well as the mentioned lower fatigue issue. With a less fatiguing effort, more people will be able to enjoy the experience of being out on the water for daylong adventures. The Nagare 21 uses a set of amas, mounted on a pair of simple, anodized aluminum tubes with quick release snap buttons holding the sections together for easy disassembly for car-topping. If a trailer is used to transport the boat, the beam of the Nagare 21 falls well below trailer maximums, so nothing special needs to be done to take the boat to and from the water. 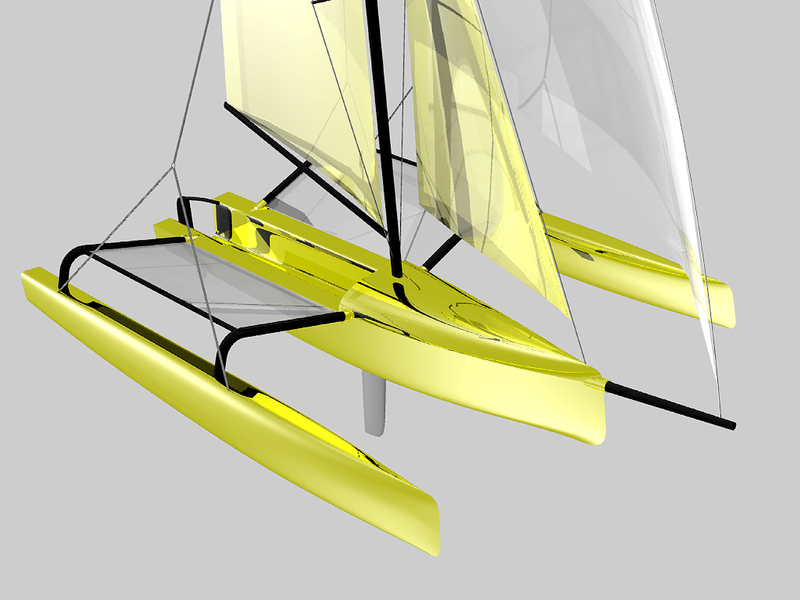 Two Nagare 21’s can be trailered, or car-topped, by removing one of the amas and placing the main hulls close to one another on the racks, or trailer. The removed amas easily fit inside the hulls and they are ready to go. The whole affair on the rooftop is very much like a pair of sea kayak doubles. Because of the length, I would not mount a boat this big on any compact cars. You would be very likely to rip the rack right off the roof in strong side winds. 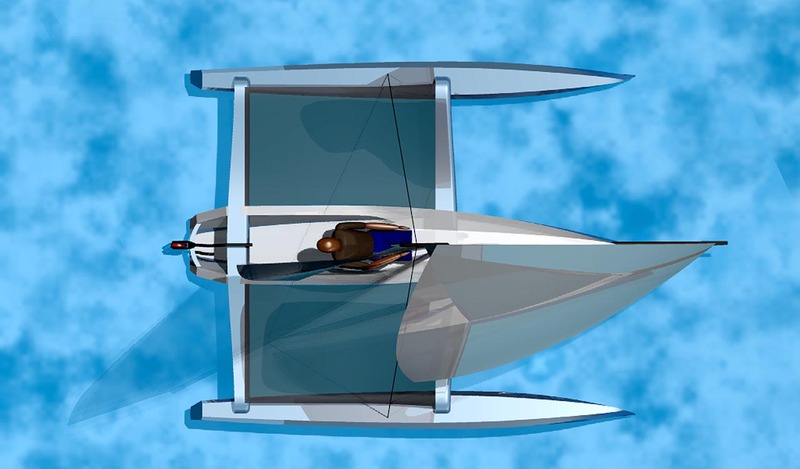 Steering is by means of a simple, flip-up style kayak rudder with control lines run through the hull to a convenient steering lever in the cockpit. 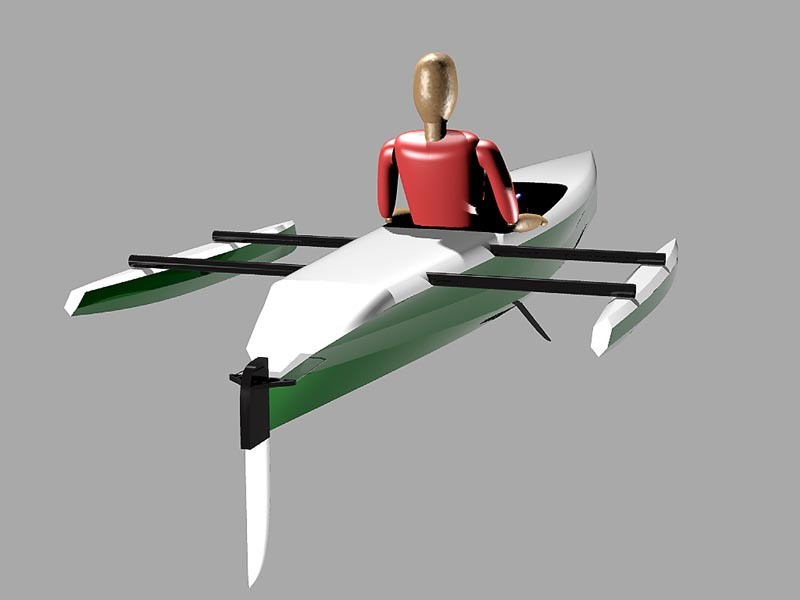 I suggest the SeaLine SmartTrak rudder system (do a search for supplier), the P-41 Multi-purpose rudder from Onno Paddles http://www.onnopaddles.com/onnocomponents.htmland the Feathercraft rudder system for hardshell boats. http://www.feathercraft.com/accessories/rudders-hardshell.php These are really great rudder units and will give excellent steering control with minimum drag. 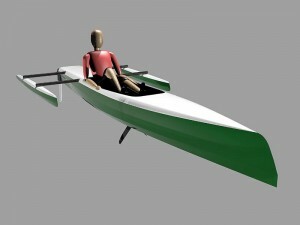 This boat can be built with a full cockpit tub so that it functions as a Sit-On-Top kayak with full drainage through the Mirage drive openings. Auxiliary drain ports are located in the tub for rapid removal of any water that comes in over the side of the hull. 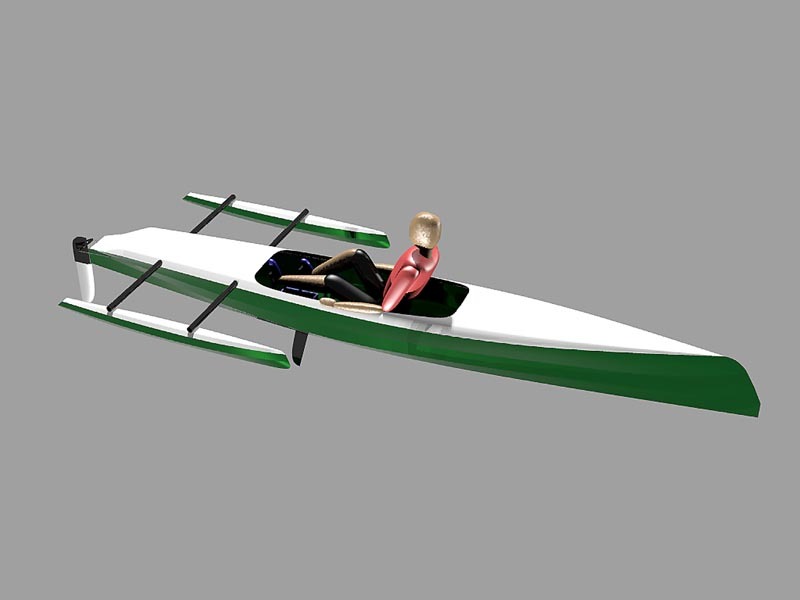 I suggest the SOT option for warm water users, with the more traditional kayak style, Sit-Inside hull form for those who will be using the boat in colder water, or more frequent inclement weather. The SOT version has internal bulkheads for support of the SOT tub, along with the capability of adding a small circular deck plate for an additional watertight compartment in the cockpit that is perfect for small items, such as cameras, wallets, car keys, etc. The SOT variation is an optional element to the base plans. If you wish to built it as an SOT, drop me an email at my regular email address and I’ll get back to you. This is not really a boat that is meant to go out in rougher conditions, such as those where a full-blown sea kayak might be right at home. It’s meant for quieter waters, such as lakes, bays, harbors and bigger rivers. It can take a session in 1 or 2 foot breaking surf, but I would not expose the boat to bigger waves, especially in a shore break scenario. You may find yourself out from the shore a bit when the wind comes up, producing steep, choppy waves. 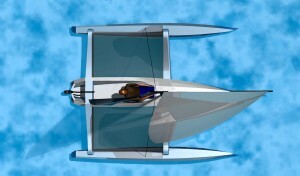 The basic Nagare 21 will handle this easily because only the cockpit will be exposed to swamping. The amas will keep the boat stable while you pedal to shore, or a quieter place on the water, where you can bail-out the boat and continue. It is a perfect boat for sightseeing, bird watching, fishing, photography, and just simple, energy efficient cruising with near bomb-proof stability (you can stand up in the boat while out on the water without your partner coming completely unglued, for instance). The Nagare 21 is a fast, comfortable and unique boat for a couple who like to get out on the water, but do not want to hassle with the business of capsize that is present in other types of boats, such as kayaks and even canoes. The solo version of the Nagare series has some very different twists, compared to its bigger sister. It has the same, highly efficient and easily driven, slender hull technology, the same set of trimaran style amas well aft for big time stability, the same generous cockpit opening and the same convenient utility for car-topping or lightweight trailering. The design elements that set this particular boat apart from its sister craft is that the Nagare 17 has a very special capability when it comes to fishing. Anybody who builds the Nagare 17 and intends to use it for fishing will probably be knocked-out by the potential for facing aft while trolling. Imagine using your legs to quietly drive the boat forward while you casually set trolling rigs, eat a sandwich and keep an eye on the fish finder… all while keeping an eye on the rigs you have set, with them easily at hand? The fisherman loads his boat, drops into the forward facing seat, hits the iPod for his favorite tunes and jams out across the lake at a remarkable speed for a human powered boat. 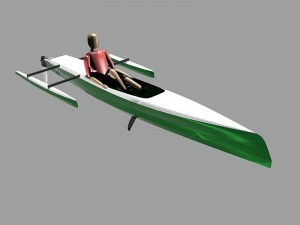 He zips across the lake in virtual silence because he’s driving a very skinny and efficient hull with no engine sounds. Once he arrives, he’s going to make a few sneaky trolling passes with his Mirage drive pushing him along over that monster crew of Pike that are hanging around on their favorite piece of structure. Wham! Fish On! and the day starts with smile on his face. If you’ve ever fished from a typical Sit-On-Top, you know that you have to face forward while trying to look over your shoulder while trolling. Hook-up and then you have to swivel around, grab the rod and go after the fish. All the time you are doing this, you have to balance the boat carefully, because the whole tamale could go over and end your day right then and there. Well, that’s how you used to do it, anyway. With the Nagare 17, you can take it to a whole new level of fishing pleasure. The Nagare 17 is equipped with twin Mirage drive trunks. 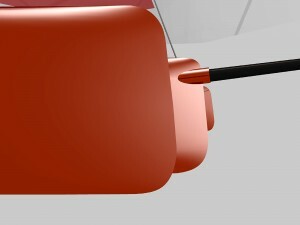 When driving the boat forward and facing forward, the Mirage drive is dropped into the forward trunk and a tractor-style seat is dropped into the aft trunk with the seat bottom resting on the top of the trunk. To convert the boat to aft facing trolling and fishing, you simply stand up in the boat and swap the Mirage drive for the aft mounted seat plug and the seat then goes to the front trunk… facing aft. With the Mirage drive still set to drive the boat forward, you simply sit down and start pedaling, slowly, up to your desired trolling speed. Now, you can watch your fish finder, GPS and your trolling rigs while you continue to tool along at your favorite speed for nabbing the fish. Get one on and simply work that rod while continuing to face aft. No twisting around in your seat, no ”just about dumped it” scenarios, just simple, fun fishing in a very stable boat. What could be cooler than that? With the fore/aft balance point of the boat set right between the two drive trunks, there is but a very minimal change to boat pitch when you change the direction you face. The Nagare 17 is further designed to accept an insulated and watertight tank between the two aka tubes where they run through the aft deck. You can use this for all kinds of stuff like: your catch, fresh bait storage, cold beverages if you catch and release… whatever suits your needs. There is plenty of room between the two drive trunks for a pretty good sized tackle box and lots of room up forward of the trunks for any of that “other stuff” that fishermen seem to sneak aboard their boats. A moveable electronics unit can be fastened at the forward end of the cockpit, or unhooked and moved around aft if you’d rather have it facing that way. Maybe you want to cast lures or flies instead of troll. The boat is so stable with the two, wide set amas, that you can stand up and cast all day without ever feeling like you are getting the least bit tippy. All in all, the Nagare 17 is quite a boat for fishing, as well as just plain fun, recreational pursuits. 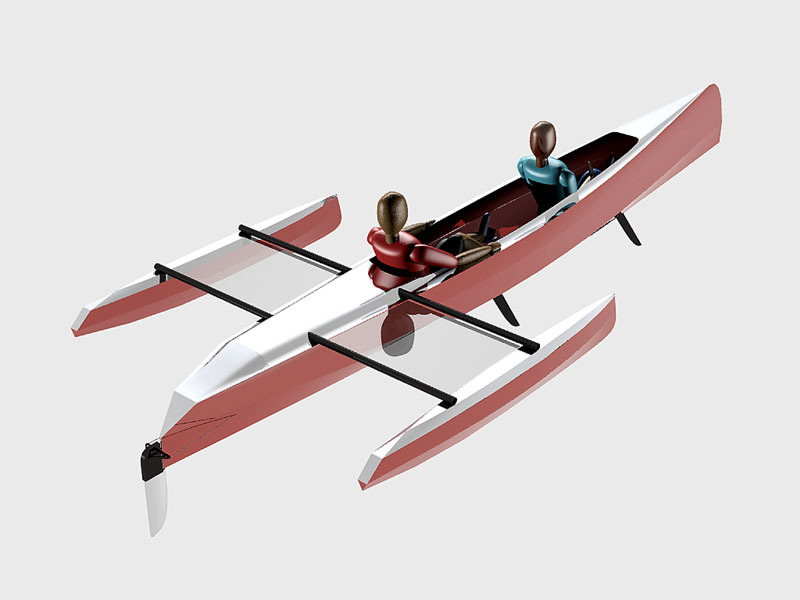 Plans are not yet complete, so if you would like to build one of these two boats, please send me an email and I’ll put your name on the mailing list for information, or watch the plans section of Duckworks for the notice. 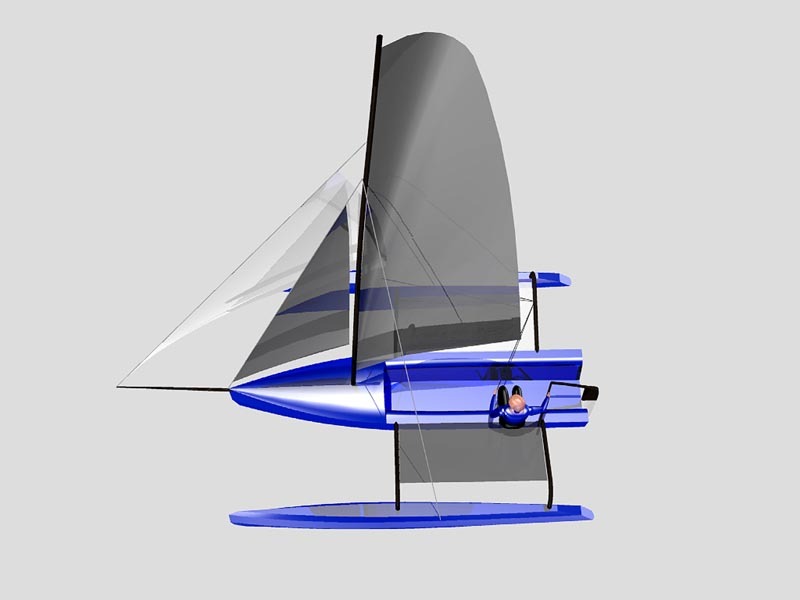 When the Montage Skiff/Trimaran was introduced, the Lunada Design website was absolutely flooded with an ocean of page hits every day right after the article was posted. I received several dozen personal query letters regarding the boat and sizeable slice of them were directed at the potential of a bigger version of the Montage. The concept of being able to build your own boat and rig it with a used mast and possibly even used sails, (if they are in good enough condition) had struck a chord with the homebuilding community. The creation of a larger version of the Montage would take the specified rig choices up into the much more commonly found beach cat rig sizes and make the business of finding a used rig in great shape, a whole lot easier. After pencilling a collection of thoughts and running some rough numbers on the potential, the idea came into focus as the 18′ Collage. The new boat is very much like the smaller Montage in many ways. The Collage has very similar lines, with the exception that it can be quickly identified by its subtle, reverse bow profile. It has a virtually identical purpose and the same, functional conceptual pragmatism for the homebuilder. The plywood version and the strip-built design both have the same bow profiles. This profile is also applied to the amas of both build styles. 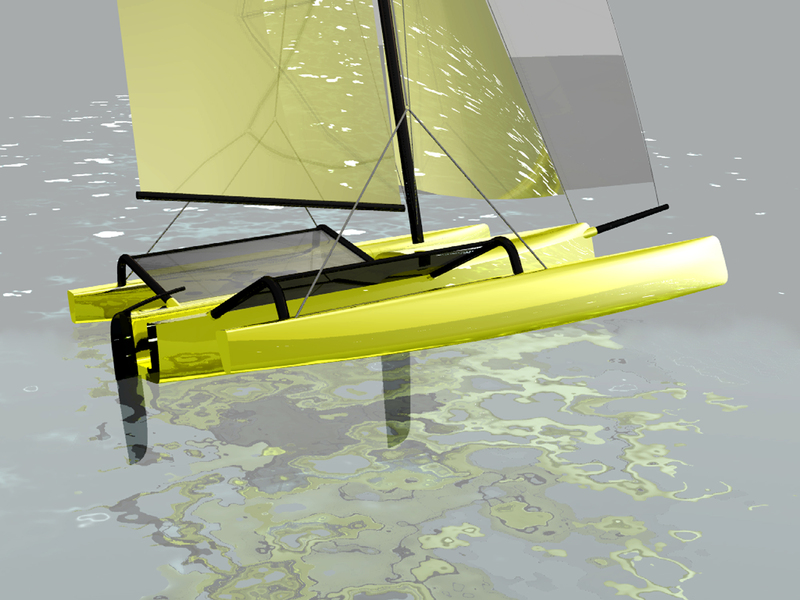 I wanted to give the boat a bit more of an aggressive look without taking it too far in the direction of the out and out racing multihull designs currently in vogue. The ama shapes, especially on the smooth hulled variation, borrow other design cues from the modern performance dedicated French designs of VPLP, as well as the very cool work of Nigel Irens. The transoms are nudged in the direction of a triangular shape, while retaining some of the typical beach cat, flat-topped U-form feeling. The volume concentration is well-forward, with the foredecks being much more rounded to provide rapid shedding of water. 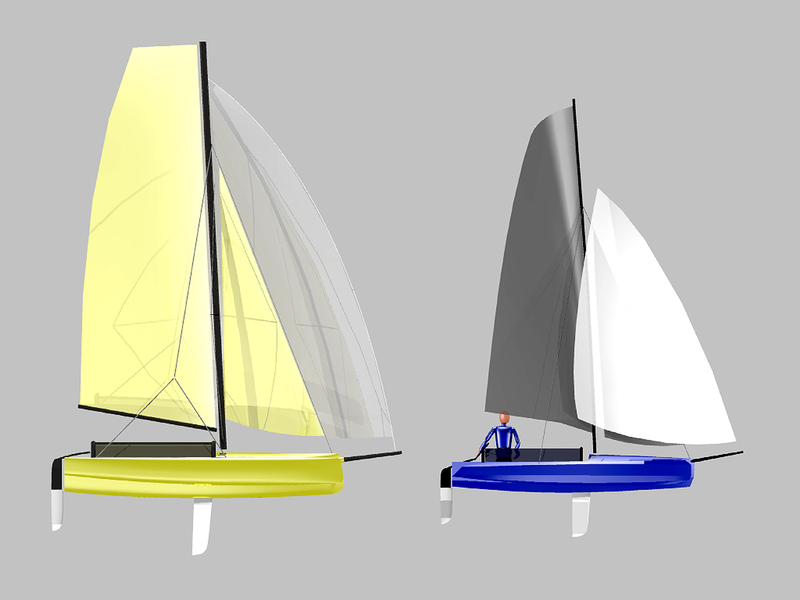 These shapes will help to reduce the tendency of multihulls to pitchpole when sailed hard. Breaking away to some degree, from the single, build style of the Montage offering, the Collage is presented as a fully strip built, smooth hulled version, as well as a multichine plywood version. These choices will give builders the ability to work with the material choices and aesthetics they prefer. I am also looking at the potential for a foam cored sandwich laminate boat using the vertical strip technique, though that iteration will probably come around a little later in the process. 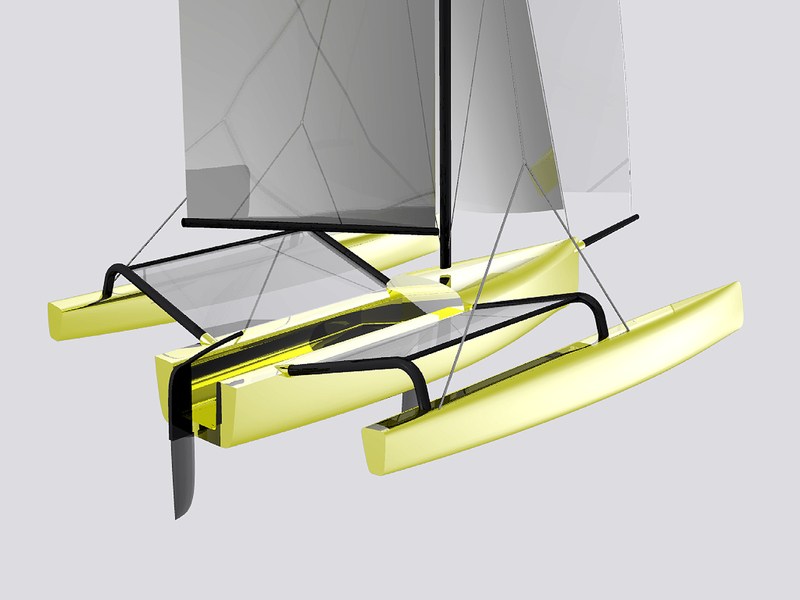 The Collage meets all the same design criteria as does the Montage, except it’s longer and wider, has more sail area, carries more crew weight and yes, it’s going to be faster in the right hands. Faster… sometimes this term can be kinda self-defeating when speed claims are made compared to another boat. When it comes to recreational boats, I’m of the opinion that speed is a relative thing based on the overall design brief of the boat in question. In the case of the Montage and Collage designs, speed is one of the attractive elements as long as it is kept in perspective with just what the use application will be from day to day. From where I sit, this will be primarily recreational purposes. The Sail Area to Displacement ratio ( SA/D ) for each of the boats is as follows: The Montage is 31.56 and the Collage is 34.88 With both of these boats being sailed at near max displacement, I give the nod to the Collage, based on waterline length, as well as the ability to punch through wave conditions that will toss the Montage around to some degree. 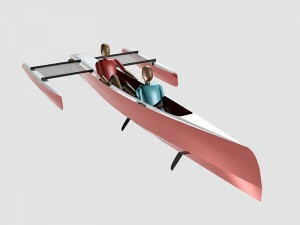 I would like to see this pair of boats ( Montage and Collage ) blasting around in the hands of skilled sailors. There’s nothing quite like the feel of a performance boat and the way it can deliver the exhilaration of a spirited ride. But… I’d also like to see this boat out on the water being used by families while they have a really fun day on the water with, maybe, a somewhat toned-down speed blast tossed into the mix every now and then to get the kids chirping. I’m looking at the potential for the Collage to create a new beach and/or lake sailing culture in which energetic hot shoe dudes, as well as young sporting families, can all mingle on the beach, out on the water and share a communal BBQ after the day of sailing. I grew to maturity on the beaches of SoCal watching the brand new Hobie Fleets do this very thing and it was a lifestyle that perfectly fit my beach kid way of thinking. It would be great to see that happen once again. Could this take place in 2009? Hey, I don’t know the answer to that one, but it is fun to think of the boat and its owners in those terms. There’s a lot going for the Montage/Collage design approach to support such a social event concept. Both boats are affordable to build, they are easily trailered by even sub-compact cars, they make use of “experienced” parts that can be had on the open market for pennies on the dollar when compared to new parts and they are boats that are easily sailed on the first day. This last part is important, as the boat will attract more enthusiasts when they see that they can be sailed with what pretty much passes for beginner’s skills. Just because it can go fast, does not mean it has to be sailed that way. As the owner’s skills grow, the boat’s potential will be there waiting for him. As a way of introducing the Montage and the Collage designs to the homebuilder market, I’d like to offer free plans to one person. This builder should be able to show me that they have a very strong interest in either design and are willing to build the boat as I supply the plans in accordance with their progress from the previous plan set delivery. If interested in this offer, you can write me at: Chris@Wedgesail.com or at lunadadesign@gmail.com and make your pitch. The one chosen to receive the free plans will be willing to provide construction photos of their progress and a brief written description as to how things are going. The personal accounts will be published on this website, Lunadadesign.net so that the readers of the site can follow the projects. 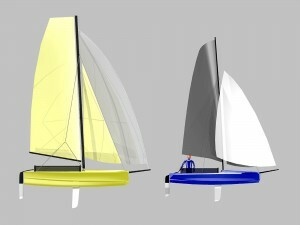 This boat created immediate appeal to beginning and intermediate sailors. 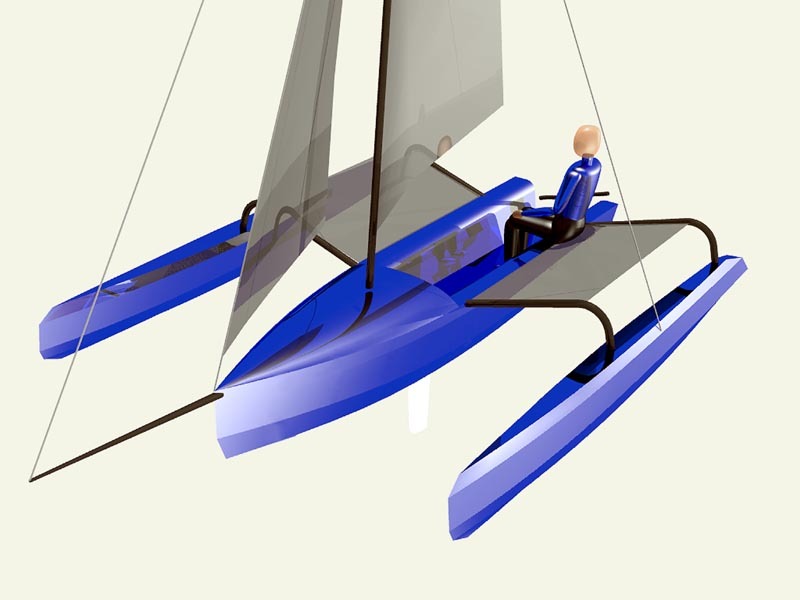 It offers much of the speed experience of a high performance skiff in a stable and predictable platform that is really tough to capsize. The Weta is one of the first boats to encourage family participation and reintroduces the waterborne fun of the beach sailing culture, established way back in the late 60’s with the intro of the Hobie catamaran. A brand new, factory built Weta goes out the door for USD $11K. 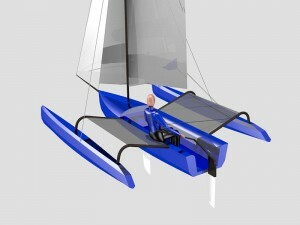 Realistically speaking, this isn’t an in surmountable amount of money for a factory produced, brand new carbon trimaran. It is, however, quite a lot of money for most casual recreational enthusiasts and the folks who like to build their own boats… especially when you consider the rugged economic conditions we all face these days. 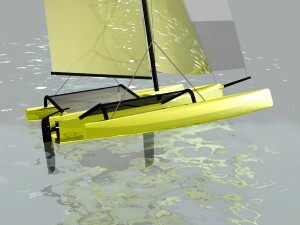 that could be buildable in the neighborhood of $5600 ready to sail with a new mast, sails and trailer. 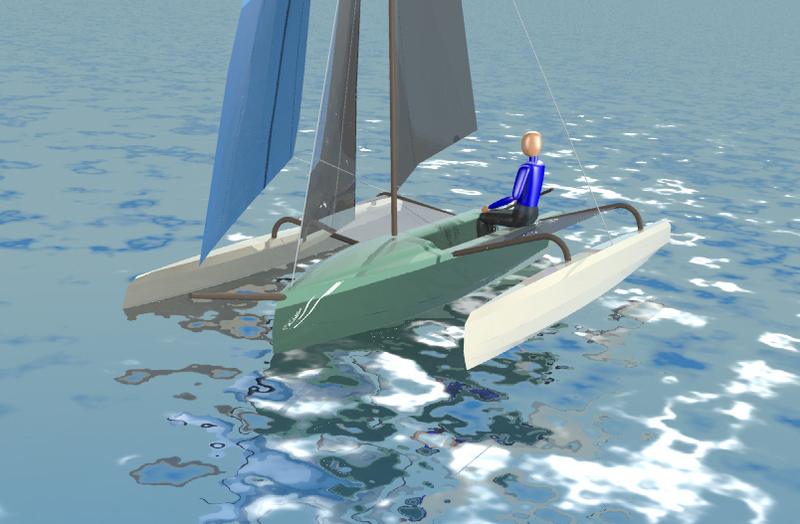 I’m calling the new boat Montage, as it is an assemblage of concepts that fill the slot between a performance skiff and a small, quick trimaran. This boat will appeal to sailing enthusiasts from kids to codgers who just want to get out on the water and have a fun and fast experience without breaking the bank. The estimated $5600 figure represents a boat with a whole host of brand new parts. For the clever builders out there, the Montage could be even less expensive if they can find a used 470 rig, perhaps a used small craft, or beach cat trailer that could be modified to fit the hull design and even a collection of hardware in good condition. The Montage is a very light boat at right around 235 lbs., so you do not need to buy a heavy duty trailer. as the manufactured version. When I projected the hull panels to a two dimensional layout, though, I saw that I was going to be wasting a good bit of plywood by going with a 14′ 5″ boat that mimicked the dimensions of the production version. I went back to the drawing table and reconfigured everything so that the longest hull panel was going to just fit on a couple of sheets of marine ply laid end to end. The main hull also got just a bit wider in the process of lengthening the boat. 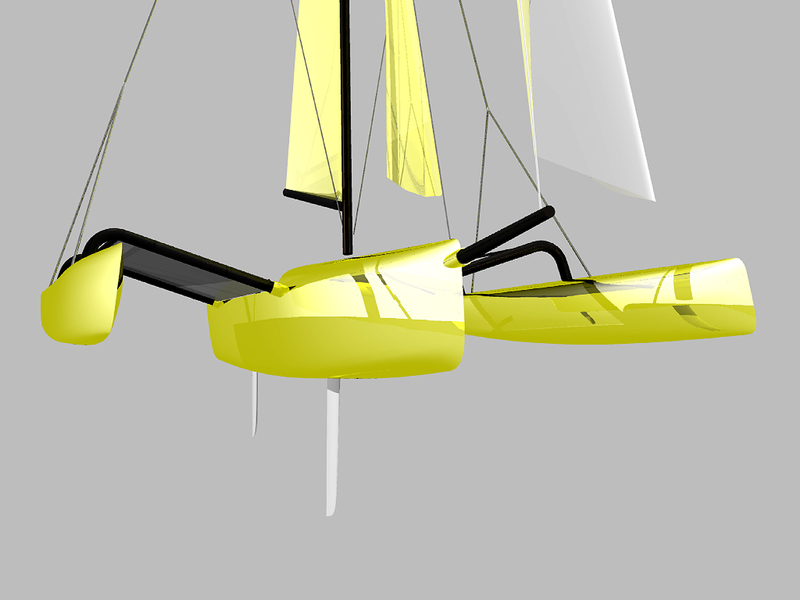 Where the factory boat uses carbon fiber on foam cores for its structure, the Montage will be a 4mm marine plywood design with full fiberglass/epoxy sandwich laminates inside and out. The foredeck and the cockpit seating transitions are strip-built in Red Cedar to give the overall appearance of the boat a smoother, more organic feel than straight plywood panels. The amas for Montage came from a 16′ trimaran design that I had already done and required minimal re-design to work with this boat. The amas are also designed as multichine ply forms with pretty high volume shapes well forward and a water shedding deck form that will helps to keep them riding high even when driven hard. Ama displacement is 100% of the all-up boat weight when sailing. The aka beams are anodized aluminum instead of carbon tubing. The inboard ends fit into fairly burly sockets in the hull and are held in place with quick release pins. Flat deck flanges on the ama ends are welded in place and bolted to the amas. The amas are removable from the aka tubes for repair or maintenance, but otherwise stay mounted, along with the trampolines, as complete units. Making these two changes from the benchmark, all-carbon Weta to an aluminum spar and tubing keep the costs down, with but a slight weight penalty over all-carbon parts. If you find a used mast, the savings will be even more substantial. The mainsail and the jib will be built in Dacron instead of a more expensive fiber/Mylar laminate sail. The jib is a self-tacking blade. The main is a boomless design, which will keep head bonking incidents out of the picture while sailing. The screacher is furled from the bowsprit for simple convenience. I have found that the more expensive sailcloth laminates are capable of driving the boat just a bit faster, but for the average recreational sailor, they will hardly ever make a difference compared to more forgiving sails in Dacron. Dacron is much easier to maintain, lasts longer, is a lot more tolerant of UV exposure and can be repaired by any sail loft wherever you go. If the builder of the Montage really wanted to, they could buy a set of sails in something like Pentex laminate instead and they’d have that hot, performance boat look that some desire along with just a bit more zip under sail. and pretty much no-brainer beaching. 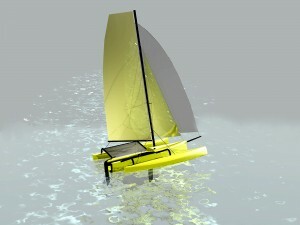 Likewise, the rudder is a flip-up style unit that eliminates the problems of hitting underwater objects. The foils will be built with template shaped cedar cores having a white ash stringer for stiffness and then glassed for durability. The aluminum aka tubes will be sold pre-bent and ready to install on the amas. If the builder has access to a good mandrel bending facility that can handle the OD/ID specifications of the tubing, they can fabricate their own tubes to supplied specs. 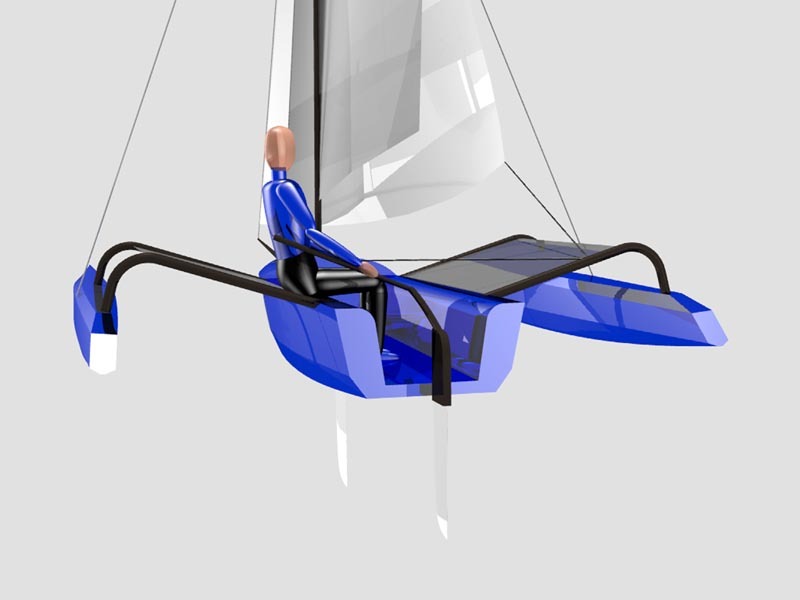 The Montage is designed to be a really fun day sailing machine that can generate near performance skiff sailing speeds while offering a hugely stable platform for recreational sailing. 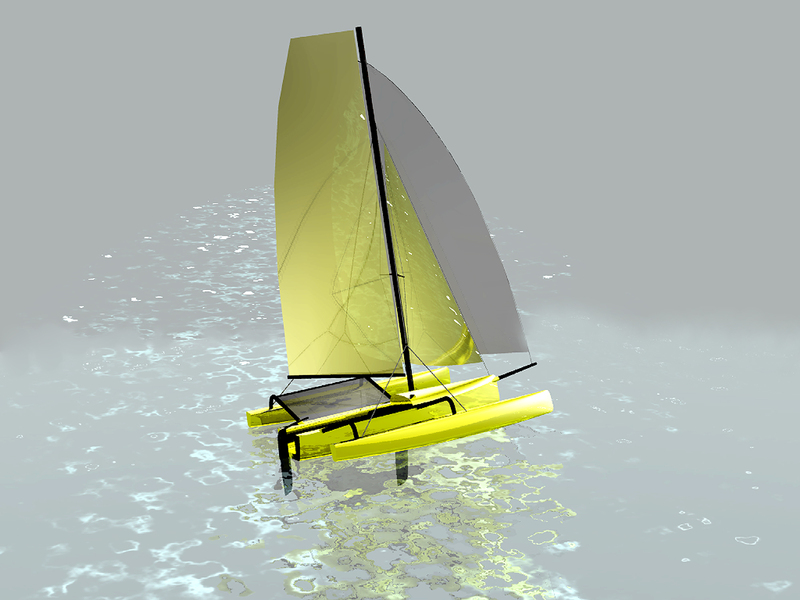 Construction of the boat is very straightforward in marine plywood with glass/epoxy laminates and can be easily built by any sailing enthusiast who has household handyman skills with tools. The Montage has been created to offer homebuilders an opportunity to enjoy this style of family sport boat at a completed cost that is far less expensive than the manufactured version.